Flea Control Secrets: Do You Need Flea Treatment For Indoor Felines? You are here: Home / Animal Books & Pet Products / Flea Control Secrets: Do You Need Flea Treatment For Indoor Felines? Above: There is a lot of confusion over flea treatment for kittens and cat flea treatment–especially when they are indoors only. Many people mistakenly believe that their indoor cats do not need flea treatment but indoor cat flea control is important if you seek to prevent cat health problems. Believe it or not fleas can invade any household and so protection and prevention is important to avoid the disease risks posed to pets by fleas. 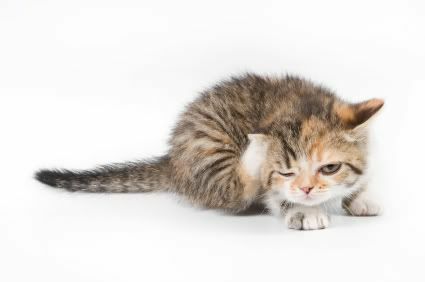 Risks posed from fleas on cats can lead to the need for veterinary treatment for issues such as flea bite dermatitis, flea bit anemia, tapeworm and more. Even one flea can cause misery for an animal that is sensitive or allergic to fleas. So, just how can indoor cats become exposed or infected with fleas? Flea infestations can occur in surprising ways. For instance, feral cats host fleas and distribute these pests to other environments as they roam through a neighborhood. In addition, other roaming animals (dogs, rats, wild animals) can bring fleas into a yard and garden or into the unsecured crawl spaces of your home. Pet parents, or human visitors, might also bring fleas into the home on their clothing or shoes. Finally, if you provide a secured outdoor area for your cat, access to the patio, or have other pets that are allowed outside, your cat could also pick up fleas. There are a few ways to identify a flea infestation. First, you might actually see a flea crawling on your pet. Another way to identify the threat of infestation is to set up a flea trap overnight (or use a nightlight with a shallow pan of soapy water underneath it). Either device will attract and drown any adult fleas in the environment–but adult fleas only comprise 5% of an infestation! Finally, every pet care arsenal should include a flea comb. Using this tool will reveal if a pet has fleas. So, how do you stop this a flea infestation threat? In the past, people relied on commercial flea control products but recently there has been serious concern over the use of flea control products on pets. If you don’t know about this issue, read important information related to the 2009 EPA flea and tick product advisory. The advisory was made after 44,000 animals were impacted adversely after flea control products were applied–resulting in 1,600 pet deaths. Today people are looking for safer, less toxic options to flea treatments but don’t realize that natural does not always mean less toxic–and many herbs and essential oils are toxic to cats. This means keeping the yard tidy and free from debris. Trim grass and consider using parasitic nematodes that prey on fleas in different stages of their development. Dusting, sweeping, vacuuming, and mopping are a few non-toxic alternatives. Bedding and favorite pet resting areas should also be cleaned. Additional strategies can include use of a product such as FleaBustersRX. Daily flea combing, a water dip, or a weekly bath in oatmeal shampoo will help get rid of fleas. Believe it or not, chemical shampoos or dips are not needed. Select a repellent such as NaturVet flea spray for cats to prevent repel fleas. Once you select your methods to address the issue you must apply everything concurrently and then repeat every three to six weeks to make sure you stop the flea infestation cycle. Want to know more? Take a minute to learn more about fleas on cats. Diana L Guerrero (aka Ark Lady) is an animal expert who you might have seen on Animal Planet, Discovery, or heard on NPR. 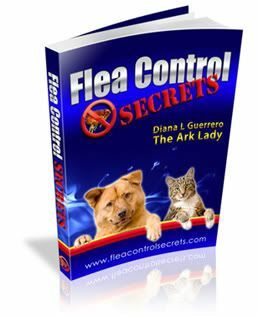 She is the author of several books including Flea Control Secrets – How to Get Rid of Fleas & Live Flea Free! Get additional tips and hints on flea control along with breaking news on the EPA advisory by following her on Twitter (user name FleaControlBook) or at Flea Control Secrets on Facebook.